Have you ever been walking down the street when the greatest blog idea pops in your head only to be forgotten by the time you arrive home? It happens to the best of us. There are a lot of programs out there designed to fix this exact problem. For me, that program is Evernote. 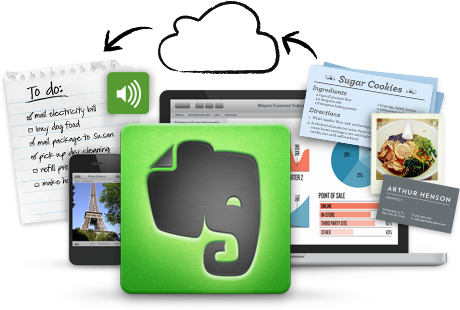 Evernote is a suite of software and services designed for note taking and archiving. A "note" can be a piece of text, a webpage excerpt, photograph, voice memo, or even a handwritten "ink" note. Your notes are then be accessible online through the evernote application for PC/Mac or your smartphone. Evernote also grants the ability to “clip” an article from the web to read later. Staying aware of current news is as easy as clicking a button. If I have an idea, I just jot it down as a note on my phone and I can access it right from my computer. The best part is that these notes can be tagged and easily organized. This can be extremely helpful when keeping your blog fresh and relevant. Evernote can also be helpful during exams for studying on the go. I can access my studyguide right from my phone on the way to class. Evernote's open API allows developers to create their own applications like Everclip or Clearly to help users get the most out of the program. Now that I've shown you what tool I swear by, what tools do you use to stay productive?